If there is ever an occasion that you want to change the date of a WordPress post there is an easy way to change the timestamp of a WordPress post. From within the WordPress dashboard, click All Posts to open the posts and then the title of the post to edit. 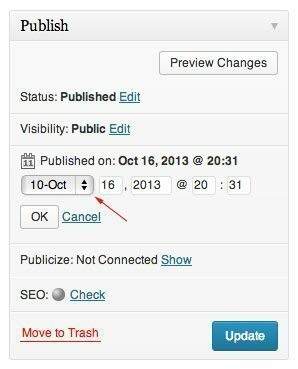 After you open the WordPress post to edit look on the top right side just under the Publish Status for the Published on date. Click the Edit link next to the date to change the post timestamp. Clicking the Edit link should open the menu to change the month, day, year and time. Make your changes and click the save button just under the timestamp menu. Keep in mind that changing the date of a post will also effect the order it’s shown in the blog loop. Clicking the Edit link should open the menu to change the month, day, year and time. Make your changes and click the save button just under the timestamp menu. Keep in mind that changing the date of a post will also affect the order it’s shown in the blog loop. I published a new post a few days ago with back date of Jan 31, 2019. On my website, it still published with date of March 14, 2019. I made several edits of the past couple of days and it would just update to whichever date I made changes. How can I fix it so that it stays on Jan 31, 2019?